What If This Were Your Family In Need of Disaster Relief? This is still ongoing in 2011 . . .
YOU are a part of HUMANITY. This is OUR World. Please help the PEOPLE of PAKISTAN. I received a story written by Amna Siddiqui, a young lady in Pakistan, a nation currently declared the largest relief aid effort overshadowing Hurricane Katrina, the Tsunami, and the Haiti Earthquake by the United Nations News Room. Following a severe plane crash (as reported by the BBC), sudden and extreme flooding has left [and continues to leave] families without homes, belongings, food, and safe water to drink. Numerous teams of people in Pakistan are bringing food, water and assisting with medical aid to victims of flood areas. The reality of this situation is not what is seen on television or newspapers. Through the mouths of those living in this disaster, I share with you pictures, videos and information. Below is Amna's story and following her story are links to teams in Pakistan to join, reputable organizations to donate to, and cell text donations. I share this to educate and inform. Many countries have and are sending aid, however, the aid is needed now. The aftermath of each passing day presents new areas of flood victims, need for more food/water, medication/medical aid workers to halt waterborne disease, and to prevent further death. All underlined links below go directly to the website mentioned. We are all a part of humanity. Please join me in lending your hand to the people of Pakistan, and if in Pakistan, join your nation in whatever way possible. 5 days had gone past; washed away more like. And with them, washed away were my house, my family, my things; things that mattered, and things that now, didn’t. And I was left alone, to ponder over its meaning. 5 days, and I still couldn’t believe it. Ramadan was to start from tomorrow; the Month of Blessings. And I wondered, with a pang of disgrace, over the things I had lost. Certainly, there was no compensation to family; my mother and father and my two younger sisters. Every single thing reminded me of them, and with every single reminder my heart would break anew. 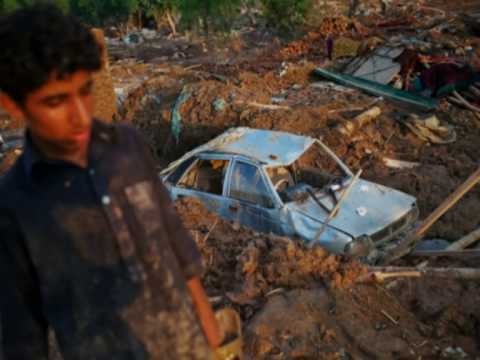 As I looked around, I would only see houses that were flattened, the school destroyed, parents missing, siblings missing, and the fruit laden trees washed away. What was there to be grateful for now? What blessings was Ramadan going to bring me? Nothing mattered to me now, as fresh tears flooded my eyes and I silently wished I could drown myself in them. With a tired sigh, I got up and started walking. It was a long and silent night. I had no idea of time. I put my hand in my pocket and felt the half eaten pack of biscuits my sister had lent me a week ago. With a tight throat, I lifted it out of my pocket and opened it. The biscuits were soggy; not really my choice. As I was counting them, a cough distracted me. I looked up and noticed a faint glow coming from a distance away. Curiously, I started walking towards it, and saw a few figures settled around a fire. My heart skipped a beat. They must have food. I thought. At last, I wouldn't have to eat these soggy biscuits. I sped up towards them. As I reached nearer, I could make out their faces. Two old men, a woman and a little girl, a middle aged man doing the fire, and two young boys sitting next to him. They weren’t talking, just sitting there drying their clothes and warming up their broken hearts. “Assalam o alaikum” I said loudly so the middle aged man and a few others looked up. I sat down on a small boulder next to him. “Azhar. From the village down the… road.” I said. “Hmmm… Do join us.” Zaheer said with a faint smile and pushed a plate towards me. It had a few dates and some rice. I looked around and noticed others had the same eccentric dish in front of them. The little girl was eating her cold rice hungrily, and the woman, possibly her mother was chewing on the dates. And I felt like someone had shoved a brick down my throat. I could not speak, I could not swallow. I just sat there with my eyes burning. Reminding myself of all the blessings I had been ignoring. How could I have been so ungrateful? I never valued the whole ripe fruit we grew in our own houses. I never appreciated my relations. I sulked over not having a brother, when blessed with two wonderful sisters. And worse yet, I loathed my village folk. I thought of them as illiterate, ignorant, crazy people. And now, all these blessings were taken away from me. And I didn’t deserve them in the first place. And now, I were blessed so much still. And here I was, a Muslim. Sitting among my fellow Muslims. None of us knew each other. The woman and her daughter, the two old men, the little boys and Zaheer himself, all belonged to different families. And were now, sitting together, preparing to Fast. Of course I still had a family. They were my family. My brothers and sisters. There was no place in the stretched out world where a Muslim was not having Sehri [the feast before the fast] right now, or any moments to follow. No matter what calamity, we were still here, assembled together for praying. No matter how many people were lost, we still had ourselves to heal us, and our belief to keep us going. And it was this belief, that linked us together, that made us a family. “Do you… have water?” I croaked. “Lots of it…” said Zaheer and handed me a huge plastic bottle. I drank the cold liquid, grateful for every gulp. “You should start eating.” Zaheer prompted. I nodded and reached my pocket and brought out the pack of biscuits and handed them over to him. He instantly opened them and distributed a biscuit each amongst us. Thankfully, there were enough. “Alhamdulillah.” [Praise to God] We both said and ate gratefully. And the warmth I felt towards my fellows in faith around me was warmer than any fire could create. Thousands of people have died, 2 million have been displaced and 14 million lives have been disrupted by exceptionally heavy monsoon rains in Pakistan since July. The U.N. says that even more lives could be lost if aid doesn't arrive soon. We patriots will be celebrating 63rd Independence Day of our beloved motherland Pakistan, which came into being on 14th August 1947. After 63 years -where we stand ? What we have achieved in this long journey? Did we accomplish any of our founders dreams? Did we give a proper law to the country? Are we REAL Pakistani! Be sincere and think for a while- are we just Pathans , Hazara, Baluch, Punjabi, Seriaki ,Sindhi, Muhajir, Chitrali ,Gilgiti and Kashmiri? Where is the unity within us? Where is pluralism and tolerance? Where is our National Aim and rule of law? Where are the rights of minorities? Where is the sense of Pakistaniat? Despite of whatever resources we have, despite of what the government is doing, despite of what the international forces are trying to do, let’s play our role to develop our country and to speak up for our land. Let’s learn how to live and help others within current circumstances. Let’s create a sense of Pakistaniat First! Taking care of our motherland will be in our shoulders Students, as Quaid –e- Azam Mohammad Ali Jinnah used to say, are the future of Pakistan. And this future is in chaos between politics and religious dogmas, between panic and terror, between monism and pluralism and between Chair and Leader, between present and future of Pakistan. We need to ponder on the REAL threats, which are the cause of today’s and tomorrow’s future. We need to redefine our dim strategy and need to develop ‘National Aim’- an aim for Pakistan under which every politician, leader and citizen can put their efforts and intellects for the betterment of Pakistan. I have seen that our elected politician work to complete the five years tenure of the Chair. So that’s why; without national aim we are left far behind. There is a saying “A boat doesn’t go forward if each one is rowing their own way.” A creative leadership is required for the country , who can lead people, who listens, who responds to success and failure and who dedicates his tenure not for party mission but for the vision of Pakistan. This land does not belong to those politicians who come and go before seasons change or those who during the hard times and trials and tribulations spend their time on expensive vacations to Europe, or those who pack their bags, rush to embassies, get the visas stamped and fly overseas. It belongs to those who support their brothers and sisters during tough times, natural calamities and those who shed their blood for their motherland, and to those who suffer and survive of it, it belongs to those to get hurt and die for it and finally it belongs to us! We can make it more flourish and more prosper only when we are civilized, aware and educated. As Quaid –e- Azam advised students, “Let me give you this word of warning: you’ll be making greatest mistake if you allow yourself to be exploited by one political party or another… Your main occupation should be – in fairness to yourself, in fairness to your parents, in fairness to the State – to devote your studies.” – (Addressed at Public Meeting Dacca, March 21, 1948). Let’s be together again and develop our nation, let’s work on our Quaid three magical words ~ Unity , Faith And Discipline. Unity, faith and discipline are the three words which made Jinnah the Quaid –e- Azam. It is blueprint of success which he shared with his nation himself. Unity, Faith and Discipline is the shortest possible distance between dream and its reality which is very much-needed in this time for us. If we follow this we do not have to beg for any aid. We do not have to go to anyone to make Pakistan better. We all want betterment of Pakistan then why are we not working for it with unity. Why we keep on combating as Pathan, Hazara, Punjabi, Seraiki, Baluch, Sindhi, Punjabi, Gilgiti, Muhajir and Chitrali. We all are hard workers then why don’t we have faith on each other? It is fruitless to blame government for everything wrong. It is our country and we have to make it better than the rest then better than the best. To craft a change we have to follow the way which Quaid showed us. We have to follow his principles to compose and rebuild Pakistan. It is three, just THREE words – Unity, Faith and Discipline. Do not let yourself be a victim. Real threat is not to our bodies, it is to our mind, thoughts and thinking. This threat is to everything which can do some good to Pakistan. Educate yourself, be aware of the danger, be familiar with the real threat. Education is main power. Get it and go for it. Let the education work to fertile your minds not only enhance your resumes and fill up your pockets. Be aware of the real danger. They can remove our bodies but can’t remove the thinking and morals. We need to educate our selves not only in technology but other fields as well, because now, it is a matter of honor, the honor of Sabz Hilali Parcham (Pakistani Flag). Be aware and do not let anyone play with our morals. Real targets are not bodies; actual targets are morals and unity of Pakistan. May be at some point we belong to different religions, races, colors and cultures but above all we belong to one Motherland – PAKISTAN…!!! All the crimes and bad things happening around us are not only because of wrong doings of bad ones but more because of the silence of the good ones.